In January, 2015, our Calibration Laboratory received accreditation to International Laboratory Management Standard ISO 17025:2005 from The United Kingdom Accreditation Service (UKAS). 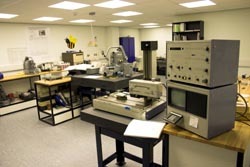 This makes us one of only two UK calibration laboratories that are UKAS accredited for measurements of surface texture parameters, and the uncertainties of 2% + 4 nm which we offer for measurements of Ra and Rq within the range 0 to 25 µm, are currently the lowest uncertainty values available from any UK calibration laboratory. The uncertainty quoted is for the distance separating the two parallel plane lines which just enclose the profile under consideration. All linear calibrations may be given in inch units. The schedule above means that we are able to measure any roughness standard, whose total peak to valley roughness height is in the range 10 nm up to 25 µm, for any of the seven R-parameters quoted, and issue a traceable calibration certificate with statement of uncertainty for that roughness standard. Wherever applicable, procedures and requirements set out in standards ISO 5436-1, ISO 12179 and ISO 25178-70 are followed. There is at present no optical or non-contact surface measurement technique for which traceable calibration certificates can be issued, and therefore all our surface measurements are done by the contacting stylus method. Our laboratory possesses a range of instruments and diamond styluses which are capable of measuring almost any kind of profile within the range of our accreditation schedule. For example, our finest stylus has a tip width less than 0.1 µm, which enables it to resolve accurately the finest details of a surface. Our certificates are able to show a diagram of the exact locations of the measurements made during calibration; this enables a customer to measure his specimen at the same locations it was calibrated at. Because our instruments are not automated, we are able to comply with special customer choices of measuring conditions such as traverse speed, filtering, sample spacing, etc., in cases when these are not defined by standard procedures.